Casting call for Clint Eastwood’s upcoming film. 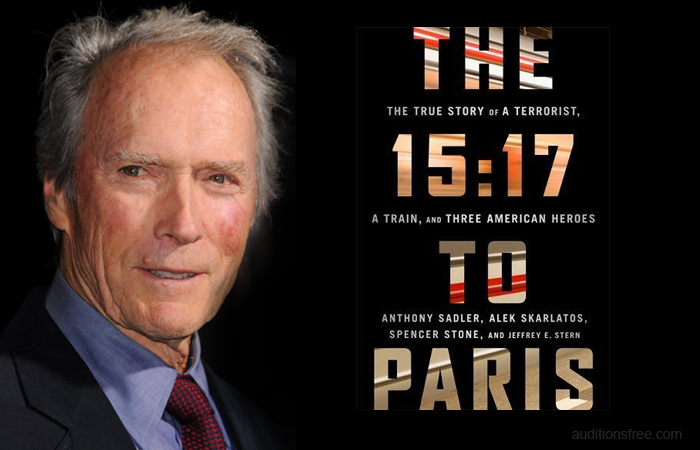 Clint Eastwood is directing “The 15:17 to Paris” and the movie will be beginning production in the Atlanta area this summer. “The 15:17 to Paris” is a drama based on the book The 15:17 To Paris: The True Story Of A Terrorist, A Train, And Three American Heroes, written by Anthony Sadler, Alek Skarlatos, Spencer Stone and Jeffrey E. Stern. The film adaptation of “The 15:17 to Paris” is written by Dorothy Blyskal with Clint Eastwood, Tim Moore, Kristina Rivera and Jessica Meier serving as producers. The movie depicts the events on board a train headed from Brussels to Paris in August 2015. The movie focuses on a terrorist attack on the train and the 3 heroes, Sadler, Skarlatos and Stone who engaged the gunman on-board the train. According to the Deadline this will be a Warner Bros. film. The cast is yet unknown for the most part and IMDB only has one actor listed so far. According to IMDB Ray Corasani will portray the terrorist Ayoub El-Khazzani. On 21 August 2015, an ISIS terrorist can on the train fully armed and ready to kill everyone on board. Ayoub al-Khazzani boarded a train in Brussels bound for Paris. We now know that he was an ISIS terrorist. Khazzani’s mission was clear: he had an AK-47, a pistol, a box cutter, and enough ammunition to obliterate the 554 passengers on the crowded train. But as he began to execute his plan, he encountered an unstoppable line of defense: three American friends, Anthony Sadler, Alek Skarlatos and Spencer Stone. Casting directors are getting a jump start on casting all the small, non-speaking roles and are now accepting submissions for various roles that will be selected by the director, Clint Eastwood. Please note that you must live in the Atlanta area in order to be considered for the roles. These are extras roles and pay extras rates. to be in a night/dance CLUB that takes place in Amsterdam in the story! Pay rate – $80 for 8 hrs with OT after that ! and put “CLUB STYLE” in the subject line. Photos of you in a Club look, looking the part, is ideal. If you don’t have photos of yourself looking the part (for a trendy dance club), then write a few sentences, describing that you have the clothes for this look/scene! There is a link below to what the looks will be like! REMINDER: You must be legal to work in the US with an unrestricted SSN in order to be hired. Live in Atlanta but don’t fit the above descriptions? You may still get a chance to work as a movie extra on Clint Eastwood’s movie. As filming goes on, more casting notices should be getting released. In the meantime, be sure to also check out all the other auditions and castings going on in the Atlanta area.